From 1935-1950, story artist Homer Brightman worked on the biggest Disney projects: Snow White and the Seven Dwarfs, Cinderella, the Oscar-winning short film Lend a Paw, and many others. A dream come true? Not really. 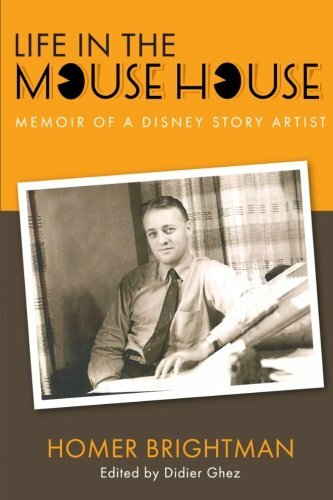 Brightman's life in the Mouse House during Disney's Golden Age of Animation was tarnished by self-serving, power-hungry animators; by draconian policies and broken promises; and by Walt Disney himself. Will the Real Walt Disney Please Stand Up? Homer Brightman first encountered Walt Disney in the men's room of the Disney Studio in 1935. Another employee had just complained about Walt, not knowing that Walt himself was standing at the next urinal, and by lunchtime that employee found himself on the street, and out of a job. Over the next fifteen years, Brightman experienced the highs and lows of working for a driven, complex, sometimes ruthless businessman and creative genius, Walt Disney, a man that other Disney artists—but not Brightman—saw as a smiling "uncle" or as a caring, patient mentor. Brightman presents the good and the bad, as he experienced them firsthand, and lets you ponder the contradictions of Walt's character. When the Disney animators weren't creating classic films, they were pulling pranks—sometimes mean-spirited pranks—on one another. Brightman recounts how he and Harry Reeves once vandalized Roy Williams' (who later become the "Big Mooseketeer" on The Mickey Mouse Club) black limousine, and how Williams got back at Reeves that night by flattening the tires of his car. The prank includes improbable appearances by H.G. Wells and Charlie Chaplin. When not pranking, the animators were politicking: Brightman goes into detail about the toxic political culture at the Disney Studio, where animators would jump to their feet and hide their work whenever another animator came around, steal credit for one another's ideas, and compete—often shamelessly—for the fickle favor of Walt Disney. The politics reach their crescendo in Brightman's nailbiting account of the Disney Studio Strike of 1941, and how Walt retaliated against those he felt had betrayed him. Homer Brightman wrote Life in the Mouse House in the 1980s. He died in 1988, and his book was lost until its rediscovery last year. When Brightman wrote the book, most of the people in it were still alive. He didn't want to offend them with his unflinchingly honest, provocative narrative, and so he changed the names of such luminaries as Ken Anderson, Perce Pearce, Ted Sears, Harry Tytle, and Roy Williams. Nearly thirty years after Brightman's death, we can now reveal the identities of characters like Muggle (Ken Anderson), Snojob (Perce Pearce), Crock (Card Walker), and over three dozen others. You'll read about these beloved Disney legends—including Walt Disney himself—as you've never read about them before. Come share Homer Brightman's life in the Mouse House!